Fabricated with superior quality raw material, our range of machined parts are widely in demand in automobile industries and many more. Technologically advanced, our range of machined parts are known to carry distinctive features such as corrosion resistance and abrasion resistance. Easy to assemble and dismantle, these enable any equipment to perform even under harsher conditions. We manufacture & supply Precision VMC Machined Parts as per customer specifications & requirements. These are supplied in mild steel, alloy steel, stainless steel, aluminum or brass as required. Close machining tolerances are achieved & supplied at competitive price with or without customer's material. Offering a range of Machined Components, we manufacture precision parts using CI and SG iron as raw material. 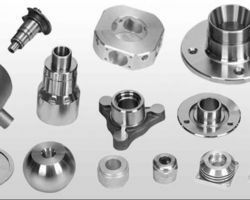 These machined components are polished and painted with proper machines and are used in various industries.